Trial By Sapphire: High Five (+ 4) For Friday! Happy Friday! Oh, gosh. Guys, I've got a problem. It's Friday which means I'm linking up with Lauren to review my week's highlights. Five of them, to be exact. But I can't narrow it down to five! I guess that's a good "problem" to have. I'll take it! Reese's Easter candy will be the death of me! I just can't say no! I had a Google Hangout with Jamie & Kim the other night! So great to chat with them in real life, to see their precious kiddos in action, and to meet two of Jamie's sisters, Julianna & Janae! I have also learned that when I become a mommy, I will develop what I now call "mommy A.D.D. ", the ability to stop mid- sentence, walk away from a conversation to for minutes to be with your child, and then return like nothing happened. I was so amused at how well Jamie and Kim did this! I was sad that my Google Effects app wasn't working, because I couldn't add a cool mustache or hat! I'm so glad someone came upon TBS through searching those words on the internet! How cool! Most likely, they came upon THIS post. It's official! I'm definitely going to my first NFL game next season. The Green Bay Packers are coming to town to play the Houston Texans! I am not a sports fanatic, but I am a Packer fan by marriage. (That counts, right?) Tickets are on sale yet, but we are going to that game! My LUSH order arrived! 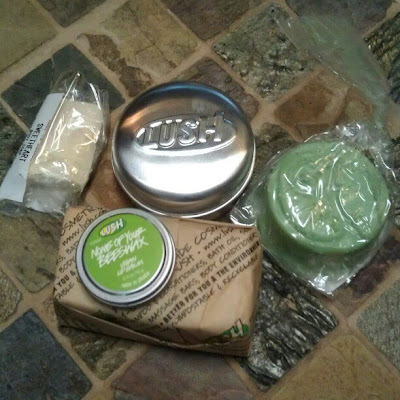 It included: Trichomania shampoo, Jungle conditioner, Shampoo Bar Tin, None of Your Beeswax lip balm, and a sample of Sweetheart soap. I'm so excited to use my new vegan stuff! I'll be in San Diego in one week! Bobbi and I exchanged many a funny e-mail yesterday discussing my blog design, and I am so amped about working with her! She's a true gem, and she is my favorite self-proclaimed awkward person in the world! Houston had a few cool, brisk mornings this week which was a nice change! I'm beginning to accept that my blog is slowly transitioning into a weird combination of modern tree-hugger blog and mommy blog. I enthusiastically write posts like yesterday's Parental Intentions, and I seem to get more comments than usual -- lengthy ones, at that! I love it! I've also never used the hash tag #babyfever more than I did yesterday. Life is good, people! If you make my lemonade, it will be sweet too. How was your week? It is not very often that I find a blog I love immediately, but I definitely have found that in your blog! I love your blog and now I'm going to have to get caught up on all of your old stuff! Oh and I LOVE Reese's Peanut Butter Eggs, but my favorite are the little football like ones in the bag! Happy Friday! Oh my word Reeses ... seriously. Good. You can get Reese's peanutbutter cups in some of the smaller convenience stores here and I inhale them ... literally! glad your video blog date went well. : ) and looking forward to your new blog design!! have a great weekend!! Reese's Easter eggs have to be the best candy ever. I swear, it's the perfect chocolate:peanut butter ratio in the whole world. I was about to proclaim my mutual, and slightly obsessive, love for Reese's PB Eggs. Then I read the first 4 comments....and was like, right, apparently that's universal. Um... I need to try a google hangout. That looks amazeballs. 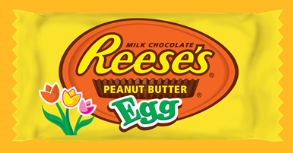 I can never turn down Reese's Egg. Never. 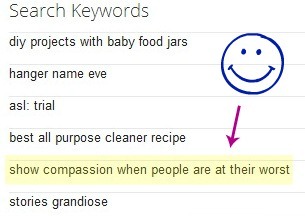 LOVE the keywords that landed people on your page...SO TRUE! And I'm so excited for your trip - I'll be living through you that's for sure! OOO what is this Lush that you speak of?! It looks awesome, i am most definitely checking that out! Ohh Reese's Easter eggs! How is it that candy always tastes better when it is shaped/colored for the holidays?! Easter candy, especially Reese's Eggs are the best! I am kicking myself for starting a cleanse the week before Easter! We love us some LUSH products!! Can't wait to hear what you think of everything. Their solid shampoos are the BEST! And I am in love with the Veganese conditioner...it totally smells like SweeTARTS! Always fantastic when you can't narrow down the great things that happened in a week!! Sounds like you had an awesome week! Lush products are the best! Enjoy! I love lush, to the point that I can NEVER decide what to buy and I have to wait till my brithday/christmas to be suprised. The perils of indecisiveness! gahh! i die for reeses. totally the death of me. I CANNOT escape candy either!! And it's soooo bad when all the Easter candy is 75% off at every single store I walk into... WHYYYYYY?!?! Girl, how do toy like the shampoo bar? I've been trying to find a more natural shampoo alternative. The one I currently use is 80% organic, but this vegan bar looks great! Let me know!